THE READERS RAG: WENDY WAX'S "A WEEK AT THE LAKE" ABSORBING AND ENTERTAINING! WENDY WAX'S "A WEEK AT THE LAKE" ABSORBING AND ENTERTAINING! 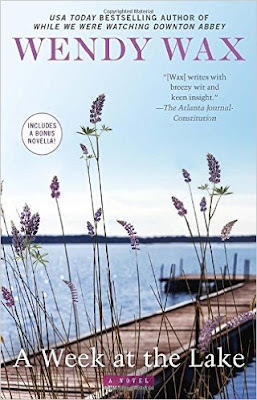 I think I mentioned that when a friend recommended I take an interest in books by Wendy Wax the first recommendation she gave me was for the book entitled "A Week at the Lake". So along with "The Accidental Bestseller" which I reviewed earlier on this blog, I also purchased "A Week at the Lake". However, it is only now that I've had a chance to read it. Bottom line, I really enjoyed this book. There is something about the ability Wendy Wax has to create a world of female relationships that is comfortable and engaging. So what is the story about? Twenty years ago Emma Michaels, the youngest member of a theater family--think Drew Barrymore--an aspiring actress Serena Stockton, and MacKenzie Hayes, a fashion designer, came to New York to forge careers for themselves, and while they were at it, they formed enduring friendships with one another. In the years that followed, for a week each summer they would get together at the Michael's family resort home on Lake George, enjoying each other's company and sharing their secrets, until five years ago Emma Michaels stopped inviting them. Now, however, Emma has decided to invite them back to the lake again, hoping to share with them all a dangerous secret which could destroy their friendship forever, but before she can join them, she ends up in a coma after a serious car accident. Will she wake up from the coma and reveal her secret? Will her scheming family take control of her and her daughter and seize power over her estate? Will Serena and MacKenzie find a way to come to terms with the imperfection of their lives and find happiness? Will Emma's daughter Zoe forgive herself for being the cause of the accident? As criticism, I will say that I did not particularly like the character of Serena Stockton who has a job as a voice actor playing an exaggeratedly curvaceous femme fatale in the fake cartoon soap opera "As the World Churns." Some of my dislike is simply that I hate these kinds of stereotypical feminine characters, but also I hated the main premise of her character, i.e. that she has been making it a way of life for the last 20 years to have affairs with married men. Ostensibly, the reason she does this is because she was jilted by her fiance in her early days in New York. I just dislike a character whose primary way of having a relationship with men is to destroy the happiness of other women. I just see no justification for that and so I'm not very sympathetic towards her. Then when this fiance reconnects with her after 20 years, instead of sending him packing, which is exactly what he deserves, she actually embarks on a torrid love affair with him. I'm like just--why? Another aspect of this story I have trouble with is that Emma Michaels has a secret to disclose to her two friends which has the potential to destroy their relationship. So why would she invite them up to the lake for a week to disclose this secret? As soon as she discloses it, the likelihood that they'd want to be trapped up at a lake for a full week talking it over is highly unlikely. Even Wendy Wax accepts that because once the secret comes out into the open, they all leave immediately! So there are aspects of the plot where you go, "I don't think so." However, as I say there are other elements of the story that keep you engaged. For instance, the relationship Emma Michaels has with her actor family is intriguing. In addition, the complexities of the Michael's family's mutual distrust and suspicions of one another combined with their common interest in the acting profession and their common experience of being well known celebrities makes for an interesting and paradoxical situation. With each of the characters, I find that Wendy Wax draws such a deep and multilayered picture of their challenges and perplexities that, as a reader, I end up being very engaged in learning to understand and appreciate what these characters are going through and what it takes for them to survive. There are some great discussion questions at the end of the book which is helpful in terms of generating a conversation with other readers about the issues the book raises. In addition, you get to dip your toes in a few extra chapters of another book Wendy Wax wrote entitled "Christmas At the Beach." In short, Wendy Wax explores the lives and relationships of the kinds of women we see every day, delving into the heavy burdens and challenges they face which others might never see from the outside. You can always rely on her books to draw you in and keep you reading.